Last month at a Celtics game, fans at TD Garden were revving up like they usually do before the action starts. Video cameras captured mugging faces in the crowd and projected them onto the Jumbotron. Beers and hot dogs were shuttled up and down the aisles. Cheerleading squads vamped and strutted through pulsing medleys of pop hits. And then, like an apparition, 12-year-old Oladunni Oladipo materialized in a dress and a string of pearls. Her eyes fixed straight ahead, she was a beacon of poise amid the commotion, singing the national anthem to a crowd that stood stock-still as her voice soared on the high notes. Oladunni has done this sort of thing often over the past few years — singing at sporting and charity events, and even at the State House — and each time, she leaves the audience wondering whom they just saw. Next month she hopes to shed some light on that question with the release of her debut album recorded with her sisters. Credited to the Oladipo Sisters, “The Mighty One’’ is a contemporary gospel record of original songs set to R&B beats. The album, which they have been recording at 12th Note Productions in Roxbury, has been long in the making since Oladunni first started wowing audiences around town after her big break singing at the Boston Pops’ gospel night in 2007. She was 8 back then and says she didn’t feel nervous at all as she took the stage for a stirring rendition of “Go Tell It on the Mountain,’’ audio of which is posted on Oladunni’s website (www.oladunnioladipo.com). It was a stunning feat for someone who had scarcely performed outside the family home. Keith Lockhart didn’t conduct that particular gospel concert, but word of Oladunni’s performance got back to him. He shed his skepticism once he finally worked with her. Even though Oladunni has been in the spotlight, music is very much a family affair for the Oladipos. Oladunni is the middle of five sisters, ranging in ages from 5 to 20, and they all contributed to the new album. 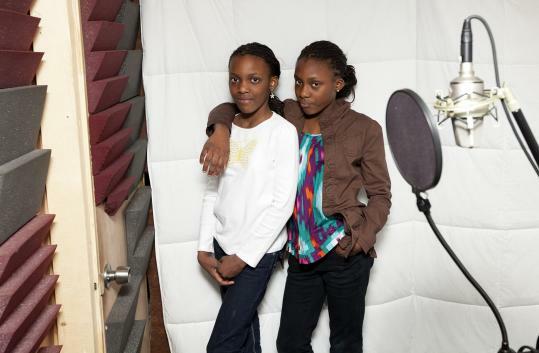 Oladunni and Olayeni, 10, are the lead singers, but their older sisters, Olamide and Olaitan, wrote nine of the songs and sang some backup. This particular album is gospel, but that doesn’t mean future ones will be. The Oladipo sisters grew up in a home full of music, from classical and jazz to pop and R&B. Lare and Yemi Oladipo, their parents, are of Nigerian descent and moved the family to England and eventually Massachusetts for Lare’s job as an orthopedic surgeon. Their Canton home is full of vibrant Nigerian art, and an entire shelf in the dining room features photos of Oladunni grinning alongside Lockhart, Governor Deval Patrick, and Mayor Thomas M. Menino. Given her confidence on stage, it’s surprising to learn Oladunni is exceedingly bashful in person. The first thing you notice is that she’s not a groomed child star in the waiting. She speaks quietly, with just enough words to make her point and a sweet little smile to punctuate them. “I like singing because it shows words in a melodic way,’’ she says. Early on, the family consensus was that Oladunni had a natural talent and should pursue it. Olamide, the eldest sister and a junior at Harvard, has been in awe of her sister’s rise. At the heart of the Oladipo Sisters is their mother, Yemi, who runs a professional ironing business from the family’s garage. She’s a businesswoman through and through. When she greets a reporter, she hands over an envelope containing a three-page list of biographies for each of her daughters. Yemi’s devotion is sincere, but don’t get the wrong idea; she swears she’s not one of those notorious stage mothers. “We learned very early that whatever your child shows interest in, you support them. You can’t force them to do something,’’ she says. As the lone man in the house, Lare says he’s used to hearing sisterly voices at all hours. Like his wife, he’s completely behind Oladunni’s budding career. “It’s great that you can find something you love at such an early age,’’ he says. As the family prepares to self-release the sisters’ album next month — both on CD and online — no one seems sure what they hope it will accomplish. When asked about her commercial aspirations, Oladunni demurs. She admits she avidly watches “American Idol’’ — as does the rest of the family — but isn’t interested in auditioning when she’s old enough. “I think I could do that, but I just don’t want to,’’ she says. And when Oladunni is reminded that she’s made her name by singing to large crowds, she seems puzzled by the prospect of doing it any other way. Would she care to sing a song for an inquiring reporter?